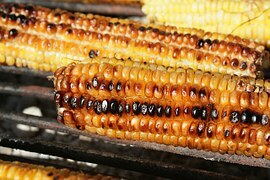 Sweet corn is a special maize variety in which its tender, delicious seeds are eaten as a vegetable. Unlike traditional field corn, sugar corn varieties are harvested when their corn-ears just reached the milk stage. A kernel of corn will ooze a cream fluid when pierced. There is no doubt that corn is king in summer. Even confirmed vegetable haters drool over fresh sweet corn slathered with butter, salt, and pepper. Corn rules the town of Olathe and nearly 20,000 participants who come together to celebrate the Corn Festival. The Olathe Sweet Corn Festival began in 1992, when it was organized by community members to celebrate the most important crop in the region. If you are interested in the festival and would like to book a room, Black Canyon Motel is an official proud sponsor of the festival. For more information visit our website or call 800-348-3495.